← e-Earth Electromagnetic Energy Fields Revolutionizing Treatment of Autism? If you’ve been following our blog, you know that we recently initiated the hosting of a series of blogs, with permission of the author, from the website Vaccine Papers that compile the scientific proof that vaccines can and do cause autism. 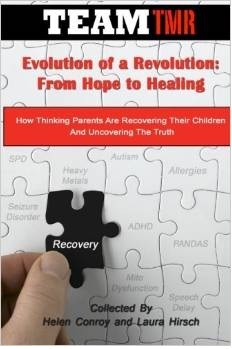 If you recall, Part 1 was about how immune activation (whether in pregnant mothers or in infants during the postnatal period when the brain and neurological system are in a phase of rapid development) can cause autistic behaviors and specific brain changes that have been shown to be characteristic of autism. 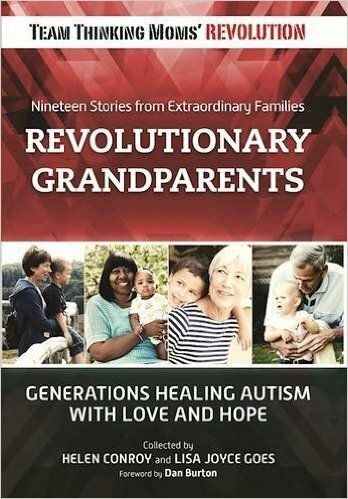 Part 2 (the original is located here) continues with the research indicating exactly which component of the immune activation is responsible for autistic behaviors and brain changes. As you will see, experimental research with mice has made it explicitly clear that the presence of a particular cytokine, interleukin-6, in sufficient concentration in the developing brain is a “necessary and sufficient” condition for the development of autism. That means that with these high concentrations of IL-6, the brain will develop autism; without them, it won’t. We’re picking up the pace a little by publishing Part 3 at the same time as it covers the scientific experiments that extend the immune activation research to primates, a necessary step as, despite the fact that the mouse research is extremely compelling, mice are not as complex as humans. 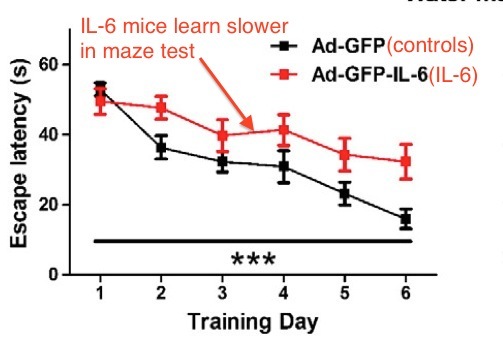 While there is no evidence that IL-6 behaves differently in mice and humans, it is important to establish that the same immune activation that causes autism in mice can cause autism in primates. 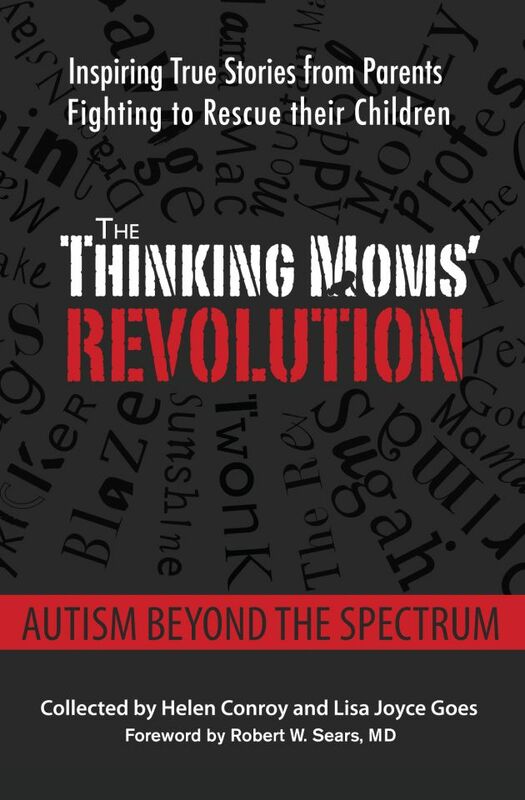 As most of the animal experiments specifically studied prenatal maternal immune activation, the next step in the logical progression towards proof that vaccines administered postnatally to children can cause autism is to show that postnatal immune activation can cause the same sorts of IL-6 concentrations and autistic behaviors as the maternal immune activation. You will find some of that evidence here and much more in Part 4. And the final step, of course, is to demonstrate that either vaccination or something contained in vaccines, administered either prenatally to pregnant mothers or postnatally to infants and toddlers, can cause the very same high levels of IL-6 in human brains. In upcoming installments, you will find that there is ample scientific evidence that this does indeed occur. As before, if there is anything you don’t understand or have a question about, don’t be afraid to ask. We think that it’s important for as many vaccine choice advocates to understand the scientific evidence as possible. Cytokines are signaling chemicals used by the immune system. There are about 47 known cytokines, organized in six families (interleukins, interferons, tumor necrosis factors, chemokines, etc). When an infection or tissue injury occurs, immune cells release cytokines as a way of coordinating their behavior. Some cytokines tell immune cells where to go; some cytokines tell them what to do. Some cytokines tend to increase immune activity, and some tend to decrease it. The actions and interactions of cytokines are extremely complex and not understood. Cytokines are also involved in communication between the immune system and the nervous system. The immune and nervous systems are deeply connected, and sometimes described with the single term “neuroimmune” system. This is why vaccine adverse effects (e.g. seizure disorders, GB [Guillain-Barré syndrome], encephalopathy) are often neurological. The interactions between immune and nervous systems are constant and profound. There are scientific journals dedicated to the study of immune-nervous system interactions, and the cytokines that are involved. Cytokines also play critical roles in brain development. While the brain is growing, neurons are dividing, migrating, forming synapses, trimming and adjusting the synapses, and attaching together. Cytokines influence all of these processes. Proper brain development is critically dependent on the right balance of cytokines. Cytokine levels are tightly and accurately regulated in the brain, especially during brain development. If cytokines are too high or low, or not present in the right ratios, the brain will be defective. Interleukin-6 (IL-6) is a well-known cytokine that has important roles in immune function and brain development. IL-6 stimulates fever during sickness. Animals lacking IL-6, or dosed with IL-6 antibodies, are easily killed by minor infections. High IL-6 is implicated as a cause of human autism. The Vargas study [referred to in Part 1] showed that IL-6 is increased in autistic brain. This is not evidence of causation, of course. But it does mean that IL-6 is a viable candidate for causing autism. Above: IL-6 is elevated in numerous areas of the autistic brain. This is not evidence of causation, of course. From Vargas et al. Another study by Wei showed that IL-6 was elevated in the autistic cerebellum (location of Purkinje cells) specifically. Above: IL-6 is elevated in autistic brain, and the cerebellum. This is where the Purkinje cells are located. This is not evidence of causation, of course. From Wei et al. 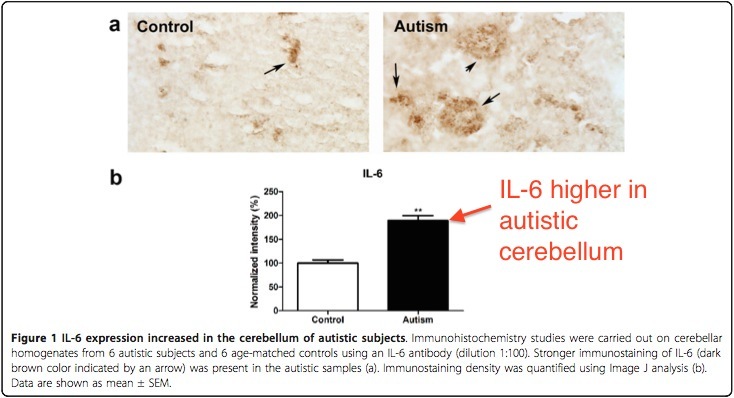 Also, this study (Full paper: “The Combined Role of Serotonin and Interleukin-6 as Biomarker for Autism”), shows that IL-6 blood levels correlate with autism severity scores, and proposes the use of IL-6 (in combination with serotonin), as a blood test for autism. This is also not evidence of causation, but of course it does establish causation plausibility. Of course, mere correlation cannot prove causation, but correlation does imply possibility. For evidence of causation, we turn to controlled animal experiments. Dr. Patterson pioneered the poly(I:C) experiments which showed that autism-like behavior and brain damage are caused by immune activation. 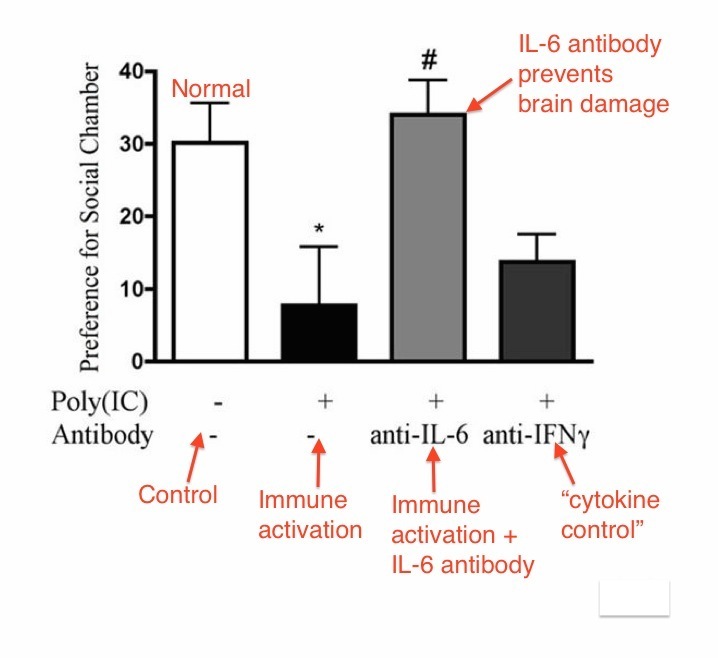 It is known that poly(I:C) immune activation stimulates IL-6 production. Poly(I:C) immune activation causes an increase in IL-6. But it also causes unknown other things and cytokine effects. In order to determine the effect of IL-6 in isolation, the IL-6 is injected alone in one group. In order to determine if there are other aspects of immune activation causing the damage, the poly(I:C) is combined with an antibody for IL-6. The IL-6 antibody selectively neutralizes the IL-6 and leaves all other consequences of immune activation unaffected. The IL-6 knockout mice provide confirmation by a different method. The “other cytokine” controls were used to determine if perhaps other cytokines induced by immune activation might also have an effect. The other cytokines were tested alone and by combining poly(I:C) with their neutralizing antibodies. Of course, all these groups were compared with saline-injected controls. IL-6 is central to the process by which maternal immune activation causes long-term behavioral alterations in the offspring.
. . . blocking IL-6 prevents >90% of the changes seen in offspring of poly(I:C)-injected females, showing that gene expression changes, as well as behavioral changes, are normalized by eliminating IL-6 from the maternal immune response. IL-6 is necessary and sufficient to mediate these effects since the effects . . . are prevented by injection of pregnant mice with poly(I:C) combined with an anti-IL-6 antibody, and are mimicked by a single maternal injection of IL-6. The results were crystal clear: IL-6 alone is responsible for causing the autism-like alterations in behavior. Such specificity is fairly unusual in these types of studies. Above: Results of social preference test. 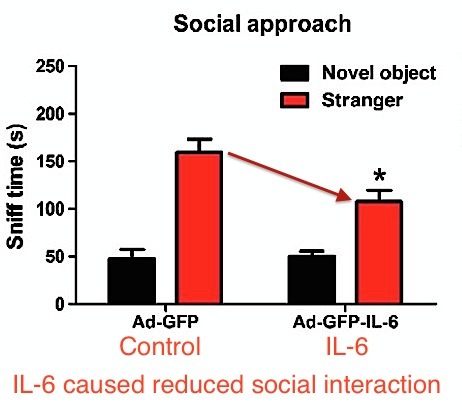 IL-6 antibody prevented social preference change in offspring. IFNg antibody (and others) did not prevent social preference change. Autism brain damage is caused by IL-6, and only IL-6. From Smith et al. Patterson’s results with IL-6 have been replicated and expanded upon by other researchers. For example, an international team of researchers (Pineda et al.) replicated Patterson’s results with IL-6. They reported that IL-6 caused autism behaviors of low sociability and impaired communication and that IL-6 antibody provided protection. They also reported that IL-6 was both “necessary and sufficient” for autism-like brain damage. This research group also discovered an independent effect of the cytokine “interleukin-1-beta” (IL-1B). IL-6 and IL-1B caused epilepsy (and autism behavior) when combined. IL-6 by itself caused autism behavior, without epilepsy. This is an important finding because about 10-30% of human autistics also have epilepsy. Above: IL-6 is necessary and sufficient for autism. 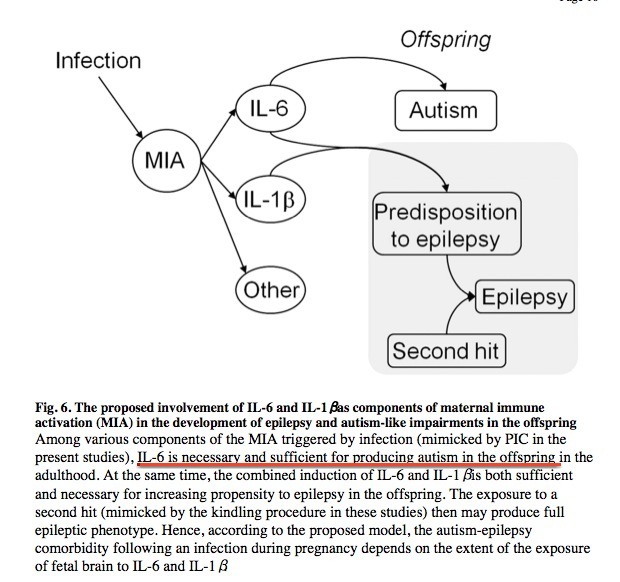 IL-6+IL-1B is necessary and sufficient for epilepsy, and causes autism behavior as well. From Pineda et al. All the above studies were done using maternal immune activation. The offspring are exposed to IL-6 as fetuses (in the womb), by stimulating immune activation in the mother. The timing issue (i.e. prenatal vs. postnatal exposure) is considered thoroughly in Part 4. A different research group (Dr. Wei et al., at the New York Institute for Basic Research) introduced IL-6 to the brain in a different way: by infection with genetically engineered virus. The virus (carrying an IL-6 gene) was injected into the mouse brain after birth. When the virus infects brain cells, the brain cells produce IL-6. There was no prenatal/fetal exposure to immune activation or IL-6. All the exposure to IL-6 occurred after birth. Control mice were injected with the same virus lacking the IL-6 gene. This is a proper control that isolates the effect of IL-6. The postnatal exposure to IL-6 caused autism-like behaviors and brain damage. Dr. Wei also observed other important changes in neurological activity. This is a very important study, so the results are considered in detail. Postnatal IL-6 exposure by engineered virus caused changes in social behavior. IL-6-exposed mice displayed less interest in social interaction. Also, IL-6 exposure (postnatal) by engineered virus caused significantly slower water maze navigation, indicating impairment in memory and learning. From Wei et al. Above: IL-6 exposure caused poor learning and memory function in the water maze test. From Wei et al. We demonstrated that IL-6 is an important mediator of autism-like behaviors. Mice with an elevated IL-6 in brain developed autism-like behaviors, including impaired cognition ability, deficits in learning, abnormal anxiety-like trait and habituation, as well as a decreased social interaction initiated at later stages. These findings suggest that an IL-6 elevation in the brain could modulate certain pathological alterations and contribute to the development of autism. Note that the engineered virus method of IL-6 exposure tested the effect of IL-6 in isolation. The numerous consequences of poly(I:C) immune activation are not present, and the control group received the same virus. Also, the IL-6 exposure occurred exclusively after birth. In this experiment,there was no prenatal/fetal exposure or maternal involvement whatsoever. Prepulse Inhibition and Excessive Excitation in Wei et al. An important characteristic of autism (and other mental illness like schizophrenia) is a reduction in what is known as “prepulse inhibition.” Prepulse inhibition is the phenomenon of a first sudden sound causing a reduction in the startle response of a second sound a fraction of a second later. So, for example, if someone behind you makes a clicking sound, you will be less startled by a loud hand clap occurring a moment later. This phenomenon is the result of constant balancing between excitation and inhibition in brain circuits. The autistic brain is not properly balanced between excitation and inhibition. In autism, the brain is biased towards excessive excitation by having an excess of excitatory synapses. The result is that autistics are constantly overstimulated by sounds and other sensory input. Autistics have unusually low or absent “prepulse inhibition.” Autistics are constantly startled by things happening around them; a prepulse has no (or small) effect on reducing the startle response. Dr. Patterson did extensive studies of prepulse inhibition in immune activation. Patterson reported that poly(I:C) and IL-6 both caused an absence of prepulse inhibition. Prepulse inhibition absence is an important characteristic of autism (and schizophrenia). Dr. Wei reported that IL-6 from the engineered virus (creating IL-6 exposure starting after birth) caused a reduction in prepulse inhibition. Wei also investigated the reason for the absence of prepulse inhibition. This was done by measuring the numbers of excitatory and inhibitory synapses. It was discovered that IL-6 exposure caused a highly significant increase in excitatory synapses, and a highly significant decrease in inhibitory synapses. This imbalance of excitatory and inhibitory synapses explains the lack of prepulse inhibition. It also explains the well-known sensitivity of autistics to sounds, lights, movement and other sensory stimulation. There is evidence that autistics have excitatory/inhibitory imbalances, though direct measurements of synapse types have not yet been performed on human brains. A growing number of studies suggest that autism is likely to arise from functional changes in neural circuitry and to be associated with an imbalance between excitatory and inhibitory synaptic transmission . . .
An imbalance between excitatory/inhibitory neurotransmission has been posited as a central characteristic of the neurobiology of autism . . . .
We demonstrate a robust, replicated autistic deficit in binocular rivalry, a basic visual function that is thought to rely on the balance of excitation/inhibition in visual cortex . . . . These results suggest a disruption in inhibitory signaling in the autistic brain . . . . It is also noteworthy that IL-6 response is quite conserved across species [71-73] and that the general central nervous system development in rodents is governed by the same basic principles as in humans . This view is widely accepted. It is not reasonable to argue that the evidence showing that IL-6 causes autism is not relevant to humans. Also, there are no known differences in the functions of IL-6 in mice and humans. This paper reviews differences between human and mouse immunology. IL-6 is not mentioned. The evidence shows that IL-6 almost certainly causes autism. IL-6 explains all the autism behaviors, damage to Purkinje cells, mitochondrial dysfunction, the absence of prepulse inhibition, and the excess of excitatory synapses. Other known causes of autism likely act through IL-6 stimulation. Further, postnatal IL-6 exposure causes autistic behavior. The immune activation need not occur in the womb. The issue of postnatal vs. prenatal immune activation is discussed thoroughly in Part 4. Click here for a list of papers in this post. Click here to go on to Part 3: Immune Activation Causes Autism in Monkeys. Click here to see a listing of the other blogs in this series. This entry was posted in Blogs by Thinking Moms' Revolution, Vaccines Cause Autism and tagged autism, IL-6, Interleukin-6, Vaccines Papers. Bookmark the permalink. Please link to Part 1 on this page. But I thought the vaccine to autism link had been “debunked” by Poul Thoresen in Denmark , and by Colleen Boyle & Frank DeStefano in 2003 of the CDC\EIS . And the BBC told me so too and they never lie .